IMPORTANT NOTICE: This is a custom trek. Contact Sylvia Alvarino for more information. Trekkers will spend several days with the children at our selected orphanage in Tegucigalpa. Before the trek we will spend time getting to know the children and put the finishing touches on significant capital improvement projects at their home funded by donations raised by Trekkers. In addition we will spend a couple of days of fun, which will include taking the children on a field trip to a nearby point of interest and then celebrating our time together with food, music, and dancing. After our time in Tegucigalpa, we will fly to La Ceiba and transfer to Pico Bonito National Park, our home for the next 3 days where we will stay in a small private lodge immersed in the jungle. 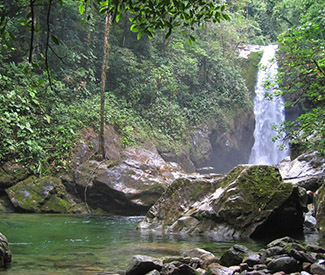 During our time there we will trek to El Bejuco waterfall and "Sister Falls" where there will be plenty of opportunities along the way to swim in jungle pools and learn about the plants and wildlife of Pico Bonito. The last day we will visit Cayos Cochinos Marine Reserve by boat where we will snorkel in the crystal clear waters, explore the reef, swim, sunbathe, take a short nature hike on Chachahuate Cay where we'll search for the pink boa constrictor which is a rare snake indigenous to Cayos Cochinos, and visit a small Garifuna fishing village for lunch. At the end of our 3-day trek we will transfer by private van to San Pedro Sula airport for your afternoon return flight home. While in Pico Bonito we will stay in a boutique lodge called Las Cascadas where our group will be the only guests. All of our meals will be taken care of by their chef. We will walk an average of 3-5 hours. No previous trekking experience needed, but we require that all Trekkers be in good physical condition and able to hike for several hours, non-stop, carrying a daypack.